Both his orchestral works as well as those written for the guitar are very interesting because of their contemporary harmony and their high creative quality. These Twelve studies are at the same time small pieces that, thanks to their musical interest, can be played at musical auditions. 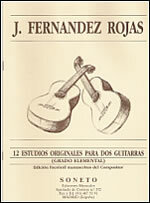 The fingerings are the author's own, and offer technical and musical contributions based on the polyphonic and timbre qualities of the guitar. These studies were composed especially for this edition.